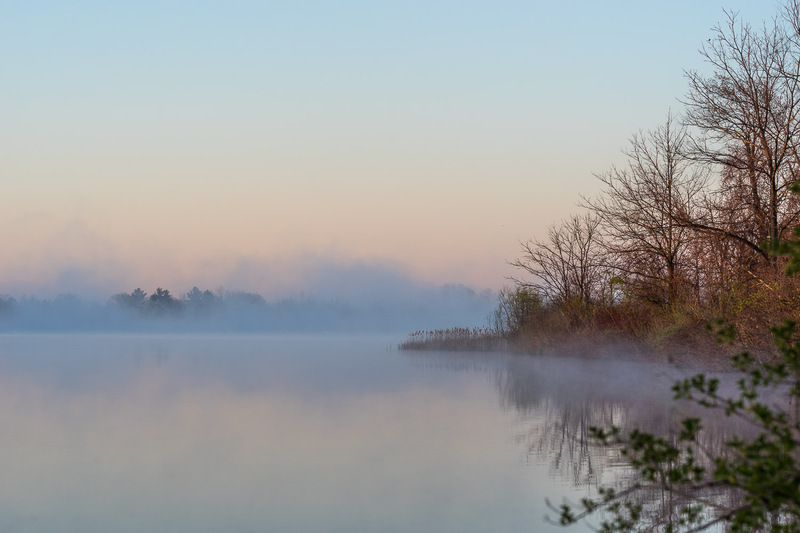 Today I rolled out of bed early and went to Stony Creek Metropark to photograph the sunrise. You can click on the small photos below to make them bigger, or you can click on the link at the bottom of the page to view a slide show of the photos in high resolution. I drove to the intersection of Mt. Vernon Rd. and E. Snell Rd. and walked into the park, to Baypoint Beach. There's a picnic pavillion along the road to Baypoint Beach, and near there is where I found the best views toward the east for my sunrise photos. 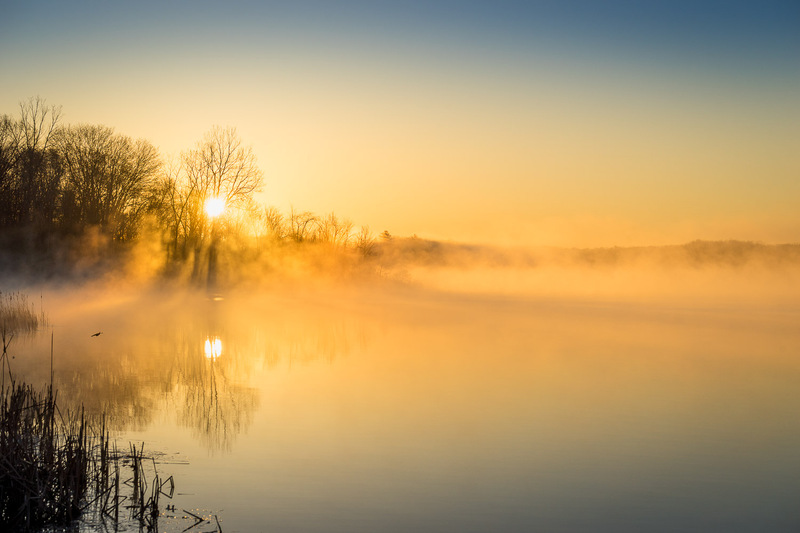 My first photograph was at 6:00 AM, and I shot about 100 photographs until 7:00 AM. These are what I consider to be my best few. 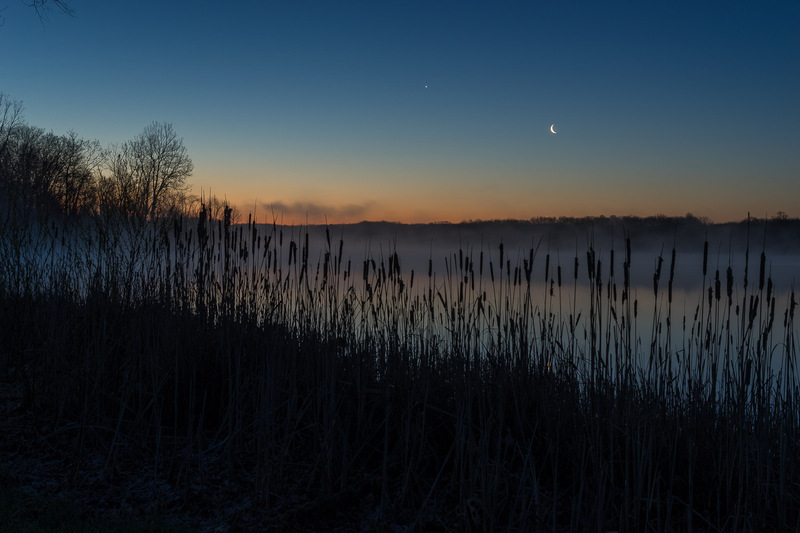 The first was right as 6:00, showing the crescent Moon in the sky and Venus to its upper-left, behind some cat-tails along the shore of the lake. But though the cat-tail foreground was interesting, I found the unobstructed view of the misty lake preferrable. 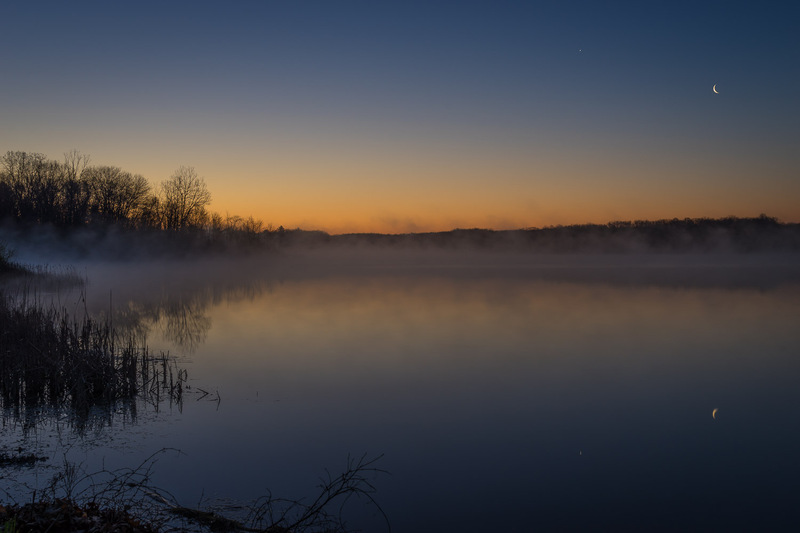 My first shot of this view was at 6:12 and shows the mist over Stony Creek Lake with the crescent Moon in the sky and Venus to its upper-left. The sky was turning blue from the Sun, still under the horizon, and the horizon burned orange and yellow. 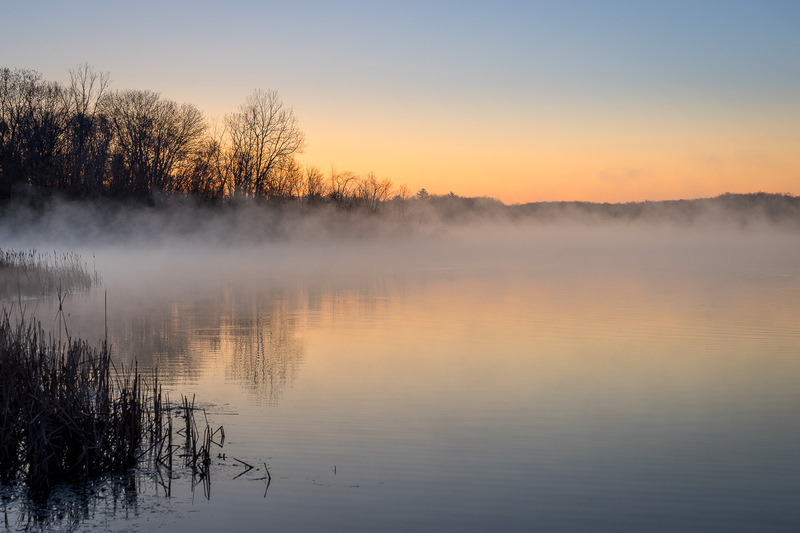 At 6:34, the sky had brightened (sunrise was at 6:38), and the extra light really brought out the fog on the surface of the lake. Though sunrise was at 6:38, I wouldn't see the sun until later since my eastern horizon was not flat. 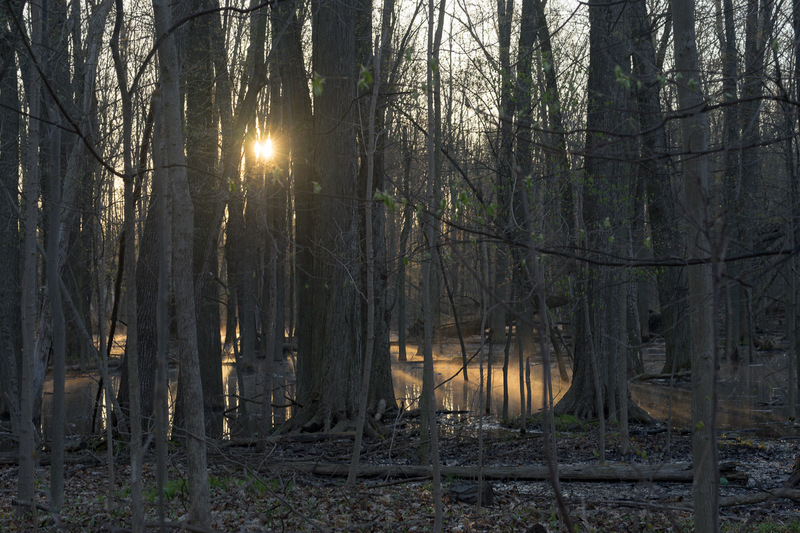 At 6:46, the sun broke above the land on the far bank of the lake and poked through the trees. 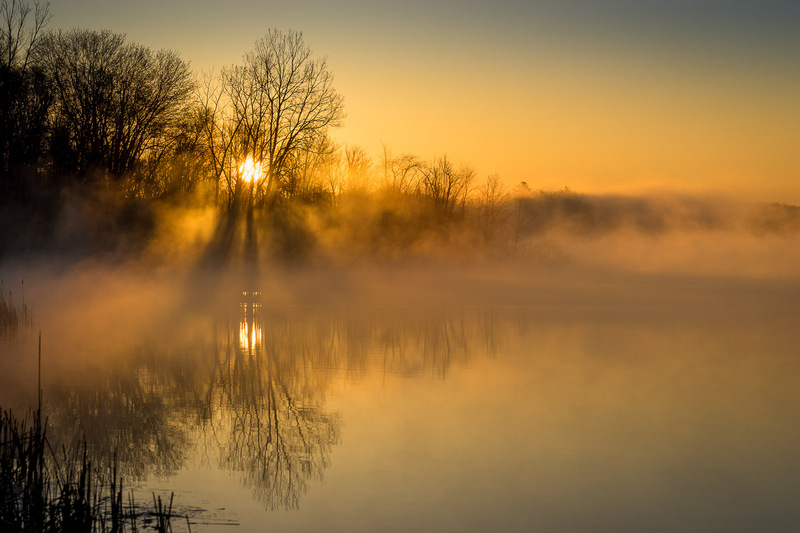 The yellow in the sky was prominent and the early sunshine lit up the fog in the distance, making for the beginnings of an other-worldly scene. 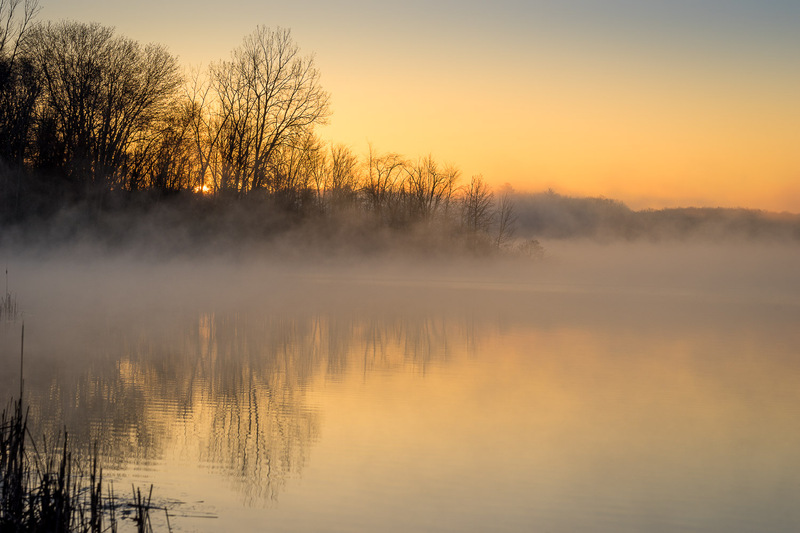 I looked behind myself toward the west, and saw that the fog over the lake was really obscuring the far shore. But the view into the sun was a lot more interesting. That otherworldly scene was really developing. At 6:51 the sun was well up into the trees, and the shadows from the various trunks in that area were emphasizing highlights in the fog, which seemed to have increased. This might just be my favorite photo of the morning; the shot in which a dragon might soon emerge! Not long after that shot, I switched to a wider view of the lake. A bird happened to fly through my camera's field of view near the left edge. 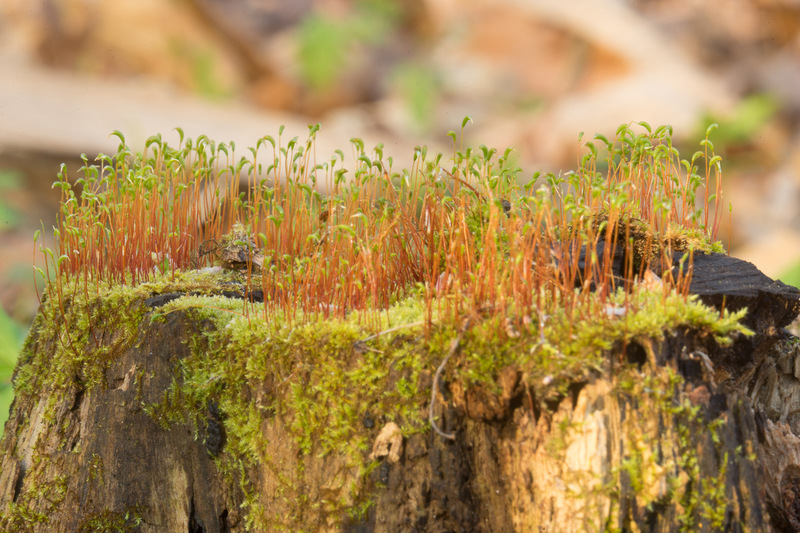 The light soon degraded as the colors reduced their intensity and the fog started to burn off, so I walked back to my car and drove up to the northern end of the park where I wanted to take a photo of some fungus growing on a tree stump. Yes, it's a very exciting life I lead. On my way I passed a swampy area and stopped for a photo. 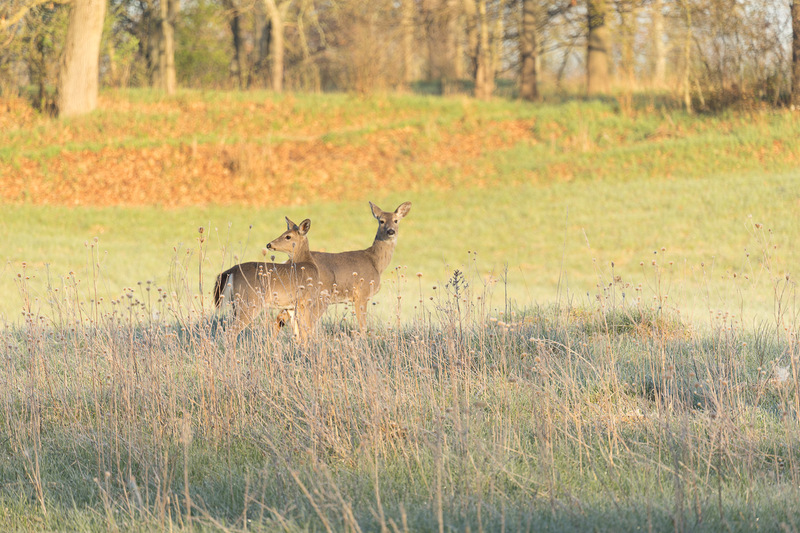 While walking from the road to fungus stump, some deer stopped to watch me. They're not really in focus, but if I show you the non-cropped photo, I might just fool you into thinking this is an OK shot. Finally, here's the fungus on that tree stump.